Any second-grader knows how to play soccer. Any last-pick second-grader knows how to play soccer while surrounded by hellish monsters, at the very least through experience in recurring nightmares. Thanks to Looterking’s new game mode and the lack of visual evidence to the contrary in this piece, it can safely be said that this rugged chiseled god of a writer is entirely prepared to dominate the field as he always has before. Adding a new casual level of whimsical fun, the new “Goblinball” mode of Looterkings is a fantastic addition to what is already such an engaging and entertaining game. This fast-paced spooky soccer extravaganza makes for the perfect competitive game as we near Halloween, everyone’s favorite month of the year. As a two-on-two soccer game, Goblinball is a fairly intuitive game to pick up. Players pick from four character classes, each with unique weapons and abilities, but the same finely toned glutes. The mechanics of each class don’t impact soccer skills too heavily, but that they don’t impact anything. Before players can get too comfortable, they should be warned, demons and monsters are up for a quick match. Creeps come storming out of the sidelines, increasing in number and power as the game goes on, with no goal in mind but to take down players before they can so much as touch the ball. The four little goblins are now set to play soccer while either avoiding or slaughtering the monsters coming to slow you down. Thankfully, if the skeletons and spiders get the best of you, health can easily be regained by harvesting mushrooms from the field. All in all, Goblinball is a very simple yet very entertaining take on a classic schoolyard game. 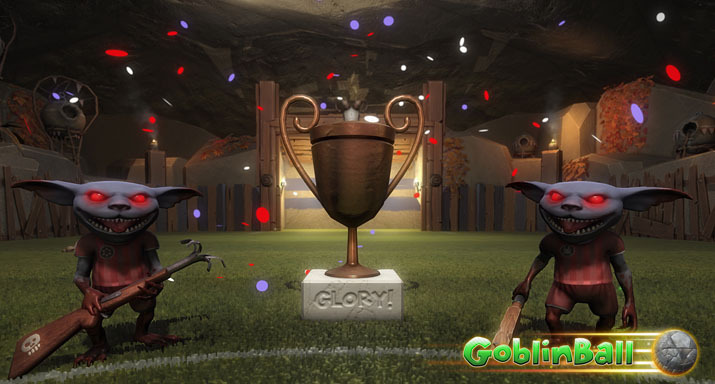 Not only is Goblinball an engaging mini-game to play, but an exciting experience to take in as a whole. Great care was clearly taken in terms of the visuals, and it paid off in spades. The characters themselves live up perfectly to society’s standards for what an ideal beautiful goblin should look like. Similarly, the enemies presented are perfectly detailed, scary enough to be a threat, cute enough to keep with the game’s morbidly-lighthearted themes. It’s not just in visuals that the developers perfected the game aesthetically, but the audio, too. All of the effects tread that fine line between humorous and horrifying, and more importantly, the noises that the goblins make are exceedingly realistic and spot-on compared to the life experiences of this reviewer. There may not be an intricate level of detail within the game, but in reality, that’s not needed here. It is the elegant simplicity in the design that makes players feel almost nostalgic for this new game. 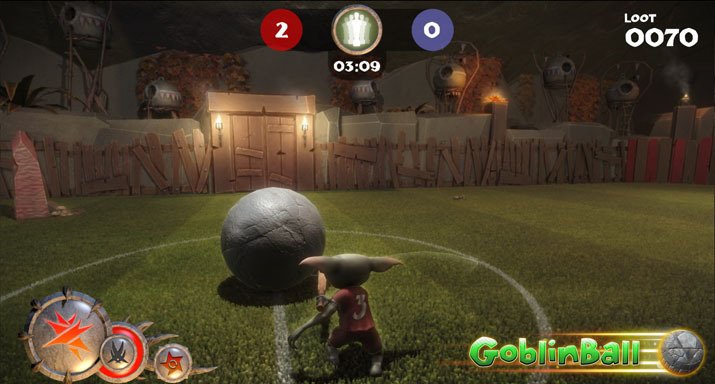 Goblinball serves to be an enrapturing game mode in an already innovative game. The full game Looterkings is a thrilling new installment in the dungeon crawler genre. Working with a team of up to three other pocket-sized pals, players run from room to room, slashing through enemies and tearing through puzzles. Unlike so many other co-op games, Looterkings doesn’t simply involve players working towards the same goal, but players working together towards the same goal. These themes carry well through into Goblinball, ensuring that the new mode feels less like a separate game slapped under the same label and more like the expansion from the original that it is meant to be.